Last year, I shared a couple of photos and tracked the progress of our firewood consumption during the Winter. We started with a rack of wood I scavenged from our yard and split myself. Having burned through that quickly, I ended up ordering a face cord of wood that arrived in early January. By February of this year, we had burned through half of the Face Cord. By March it was gone. We ordered a mix of hardwoods last year and I think we got a bunch of Ash along with some Oak. This year, I wanted to get ahead of things and decided to order in September. And I wanted to order some specific woods: Cherry and Birch. Like last year, I used the same provider (Best Firewood and Mulch) but I ordered a full face cord of Birch. And a full Face Cord of Cherry. The Cherry for long-burning nature and, of course, the smell it puts off and the birch for the heat output and the bright and lively flames. On the delivery day, the two guys arrived with a truck full of firewood and a custom rig of dolly. 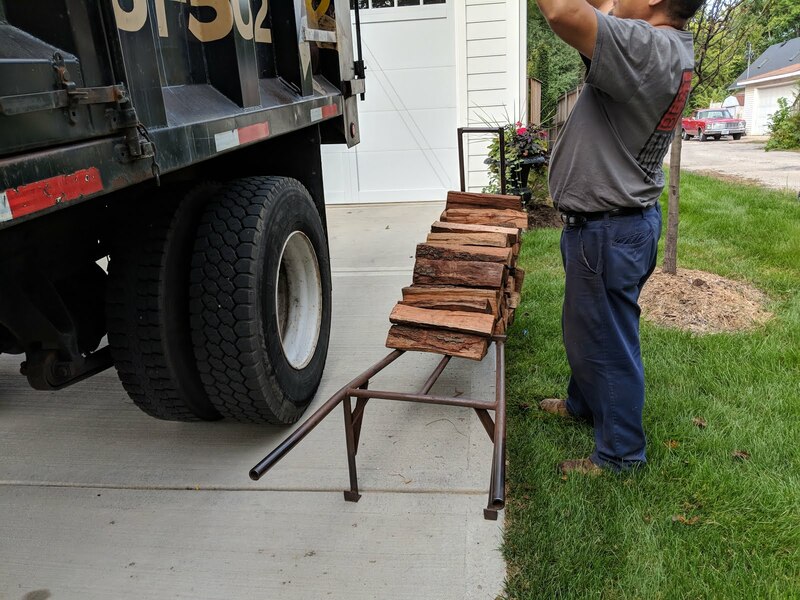 They unloaded the wood by hand - throwing two pieces over the truck at a time. The guy on the bottom caught them and stacked them. It was hypnotic as they moved in coordination. I bought seasoned wood and the two varieties (Birch and Cherry) aren't that widely available - at least according to the lady at Best Firewood. That's a big reason why I ordered now: to ensure I get good quality wood. The later in the season you order, the less chance they have good, seasoned wood in the varieties that you'd like. So, this year, I've ordered in September. Figure this is about 420 pieces of firewood. There are about 150 days between October 1 and March 1. That's 21 weeks. Or about 20 pieces of firewood per week. If we burn a fire four days a week - which is what I think we average - then we can burn about 5 pieces per night. I think it is more likely that the weekday night fires will burn three to four pieces, but the weekend nights, we'll burn more. I'll post a few photos this Winter to show the progress on consumption over the months so I can track how we did against my target of 20 pieces per week. As for the level of seasoning on the cherry firewood and birch firewood, I'm not sure, to be honest. I just ordered a moisture meter to get a real sense for how dry these things are, but they pass the 'knock together' test - meaning when I swing two pieces of cherry together they kind of 'knock' a hollow sound. There are *some* cracks or "checks" in the ends of the wood, but not a ton of them - which is one of the usual signs of seasoned wood. 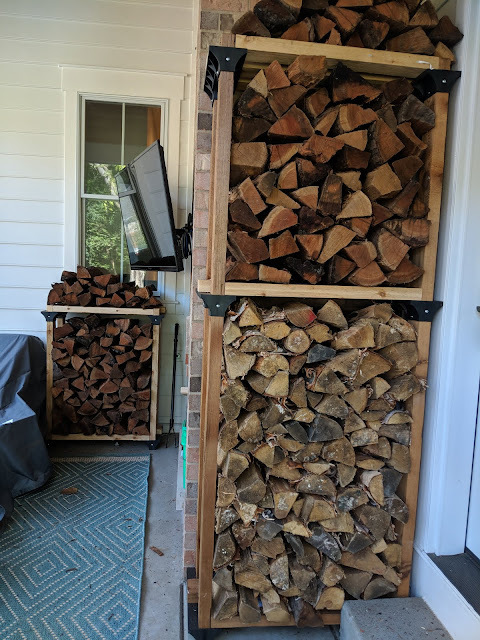 But, in addition, by ordered in in September, I got not only the wood I wanted, but I also am able to put the wood in a dry spot, out of the weather, on racks that get circulation. That means that they'll continue to season in the months of September, October and November - which is about when I think we'll get into the heavy usage. Back in September, I showed off here on the blog the in-progress new firewood racks that I was building in the screened porch. By the time these guys arrived, I had both of these new racks complete. Here you can see that they've loaded Cherry firewood into the top section of the front rack and the entire back rack. You can see the reddish color of the Cherry wood ends in the rack. And here's the bottom part full of Birch firewood. This rack in front is the closest to the door of our Family Room, so I decided to do a combo there. But those two racks weren't enough to hold the two face cords. As I've posted before, I have dreams of building a cool woodshed, but I ran out of time this year. So, I set up another rack on a little stoop outside the sidedoor of my office. This area is elevated and is covered from the weather - that's why I selected it. I had the rack from last year up there, but that wasn't enough room. So, they stacked the rest of the Birch on the left. You can see the birch bark peeling on the stack on the left. On the right is mostly Cherry. 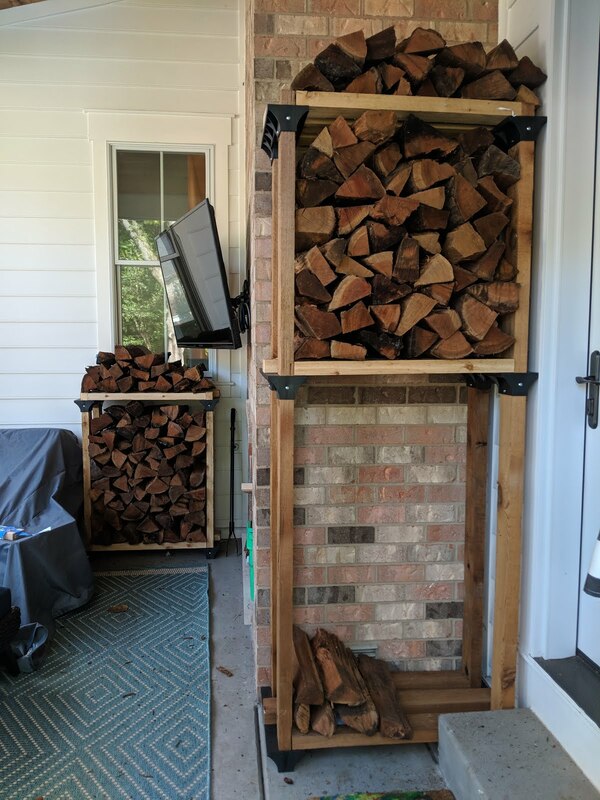 While the weather isn't terrible, I'm going to be doing the walk to go get wood from these racks and leaving the wood inside the screened porch for when the temperatures drop. 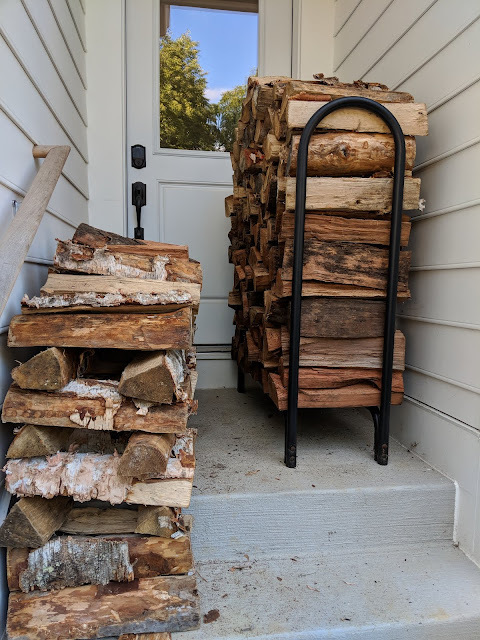 I figure that between pulling some wood from this side door section between now and snowfall and finding a nice day in the winter to move the balance of this wood to the indoor racks, I'll mostly have wood that is dry and seasoned.